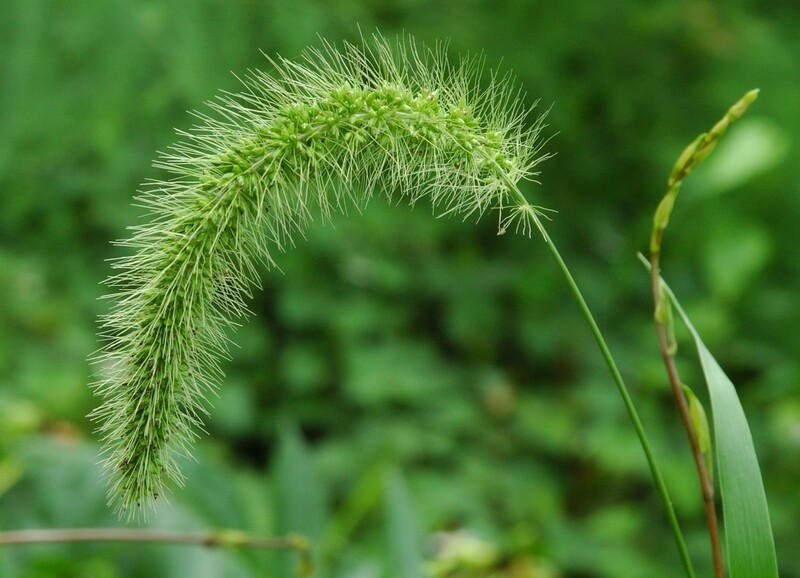 Setaria faberi is an annual, a C4 grass, robust, 50 cm to 2 m tall branching from near base, sheaths hairy along margins, ligule a dense band of hairs, about 0.1 cm long. Leaves 15-30 cm long, 1-2 cm wide, rough on both sides, sparsely long-hairy above, hairs warty-based. Flower spikelets 2 flowered (only one fertile) to 0.3 cm, above (usually) 3 pale bristles, about 1.5 cm long, in very short branched clusters, self pollinated; inflorescence a cylindrical, long-bristled spike, nodding from near base, to 6-20 cm long, 2-3 cm wide, including bristles, axis hairy; blooms and fruits July-Oct. Seeds eaten by numerous birds and small mammals Seeds eaten by numerous birds and small mammals. Habitat: Pioneer on bare ground, disturbed edges, roadsides, good quality fill, piles of soil at construction sites. Notes: Much like S. viridis but usually larger. Plants eaten by rabbits (Martin et al 1951). .